At 37 weeks, hiccups seem to be increasing in strength. They still happen daily. The kid is still moving after meals and late at night as well as early in the AM. Braxton Hicks contractions are coming more frequently. Often, I can tell that they’re gonna happen before they actually happen! I feel a strange drug-like feeling in my chest or my head akin to lightheadedness (but I’m not dizzy). Then my uterus contracts. It’s weird to be able to know when they’re about to happen. Although, when my midwife was here this week, she tried to palpate to see how the baby was positioned and said, “Oops! You’re having a Braxton Hicks!” And I had no idea! Other notes from my midwife’s visit: my BP at 124/68; the babe’s HR in the 140s, the babe is still head down, facing right; and fundal height was 37 cm (right on target!). Thankfully, this week, I’ve had no swelling in my feet or ankles. I attribute this to activity, rest, and Vitamin D / Cod Liver Oil. And seriously, BOTH activity and rest (laying on my side for an hour) helped! Not just hanging out on the sofa or in a chair. Specifically, being active (i.e. going for a walk) and laying on my side has been what’s helped. I think my vaginal fluid has increased slightly; but that’s normal, I’ve read. Rolling over in bed is quite the challenge! I like to joke that Nighttime Sleep is my hardest workout of the day! At 37 weeks, I feel like my plan to have low-carb days and mod-card days (essentially carb-cycling and kinda calorie-cycling) has helped me to decrease swelling and feel less puffy! My bump has totally gotten bigger while I feel like my legs have and calves are feeling less squishy. I’m still “aiming” for a babe that’s between 8 and 8.5 lbs and about 21 inches long. The clementines that arrived with this week’s grocery order taste “off” so I’ve been avoiding them. That said, I think I’m still craving Vitamin C because yesterday I passed a Jamba Juice and couldn’t help myself. I ordered a “orange-raspberry-banana” smoothie. It was perfect. 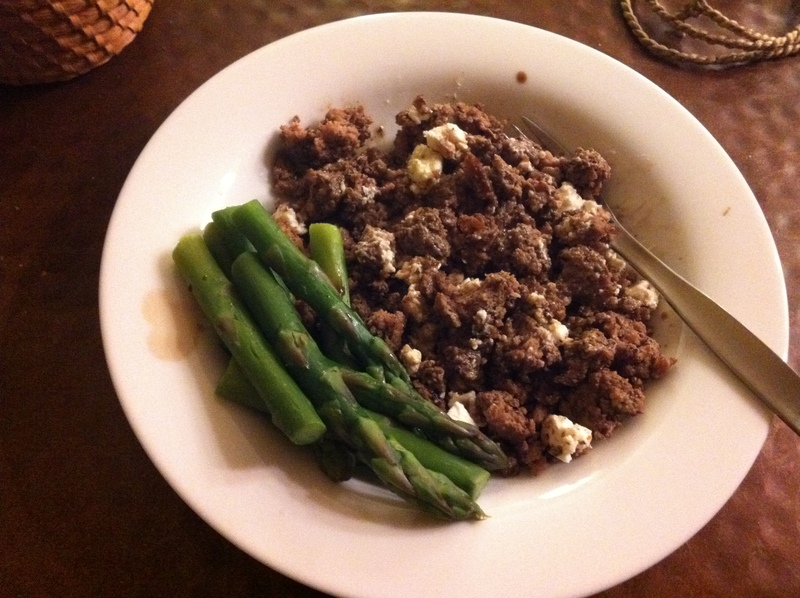 Ground beef, olive oil, balsamic vinegar, feta plus asparagus. 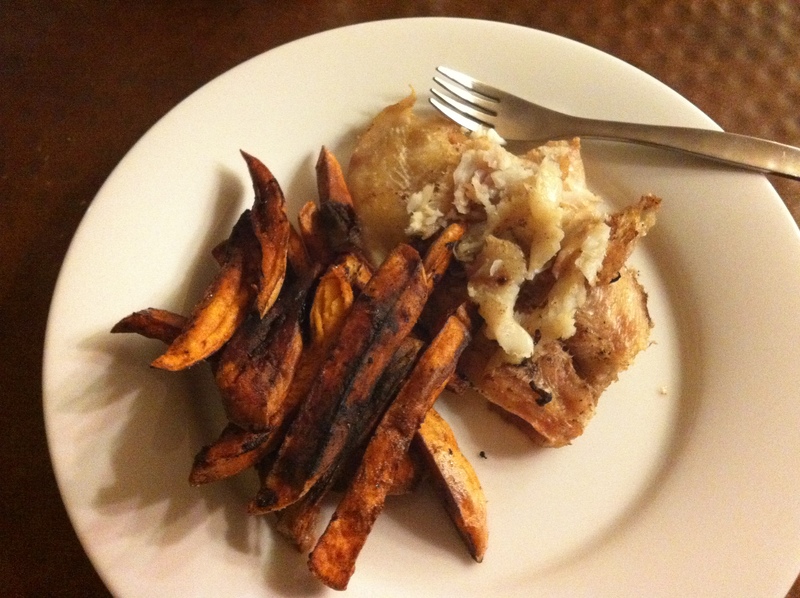 Broiled flounder plus sweet potato fries cooked in lard. Supplements I’m still taking: Vitamin C, enzymes, probiotics, vitamin D, Cod Liver Oil/Butter Oil capsules, magnesium. After last week, I’m amazed at how much I did NOT do activity-wise this week. All I did was walk. I wonder if this was a week where my body just felt like it needed some recovery? I don’t know. I just know that walking was what felt right this week. I do think I’ll get to the CrossFit box at some point in Week 38, but I don’t know how much I’ll do. 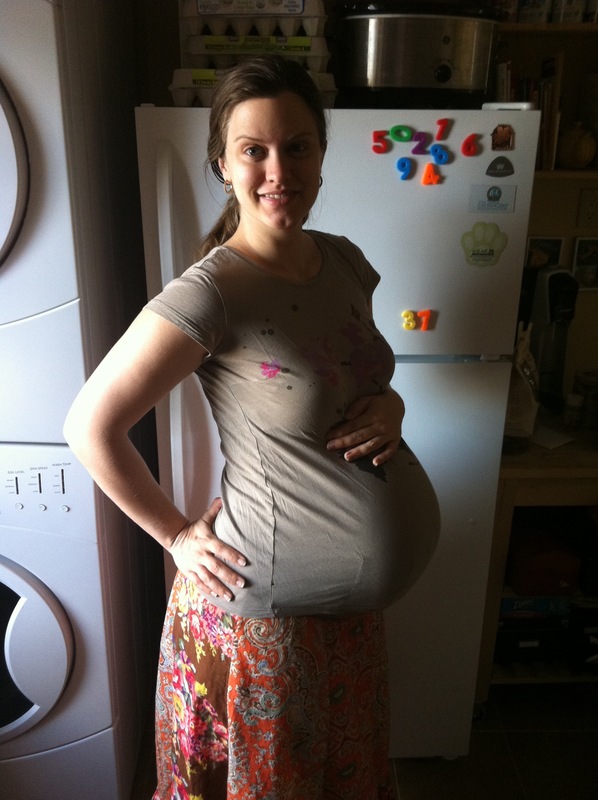 Here’s a picture from 37 weeks! Gilliebean at 37 Weeks Preggie! Another thing to mention this week: I attended the home birth of a friend up in Upper Manhattan. The whole thing took about 12 hours. It was her second baby. She texted me around noon saying that her contractions had been about 7 to 10 minutes apart since 9 am and were lasting about a minute and that she thought “today might be the day!” So I took my time getting there, arriving about 5 pm (I’d hoped to arrive by 4 pm). By the time I arrived, her contractions were about 3 minutes apart, lasting 1 minute and her midwife said she was about 5 cm dilated! I supported the birthing mother, midwives and other support persons as best I could while also learning as much as I could (since I’d never before witnessed a birth in person!). She progressed rather rapidly. Around 6:30 pm, she announced that she’d be pushing by 8 pm. We all kind of rolled our eyes… But she was pushing by 8:30 pm and her little girl was born at 9:13 pm! The healthy little 8-pounder came out pink and screaming! I was so honoured to have been invited to this birth and I was so inspired by this mother’s strength and determination. It was truly beautiful and amazing. At 36 weeks, baby hiccups are common. The babe is still moving after meals and late at night as well as other times of the day – consistent patterns. Braxton Hicks contractions are getting more common. I got some swelling in my feet and ankles this week. It was very uncomfortable; but nowhere near as severe as a friend of mine who gave birth recently. For myself, I wonder if it was a combination of lack of activity (due to burning out my round ligaments on four 200m runs) and running out of Vitamin D and cod liver oil. After I brought back the morning walk and the afternoon nap, the swelling improved significantly. And then when my cod liver oil arrived, it vanished. Could be coincidence or could be helpful info! Third trimester tiredness is really a thing. 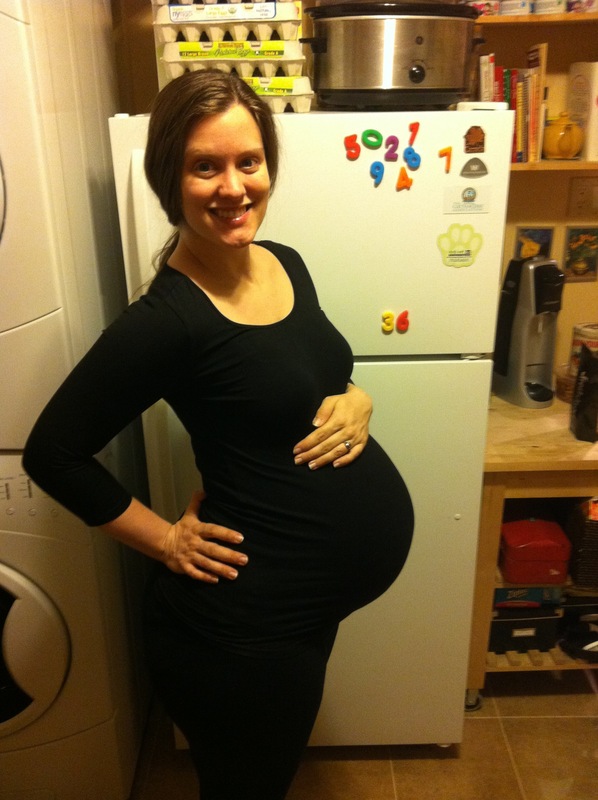 And to be frank, this babe (and his or her whole package – the uterus, bag of waters, etc) is getting heavy! I have to pee more often. My lower back is starting to get a little tired. I have to eat smaller and smaller meals, which means I eat more frequently. But honestly, all my symptoms have felt pretty “textbook” to me; so I’m pretty happy with a rather uncomplicated pregnancy! At 36 weeks, I’m trying really hard to have four low-carb days and three carb-days each week. Basically, Monday and Tuesday are low-carb, Wednesday is mod-carb. Thursday, Friday is low-carb and Saturday, Sunday is mod-carb. I’m doing this because carb-cycling is easier for me (to keep overall carbs low) and before I discovered that I was pregnant, I found that it jived pretty well with my metabolic needs. I’m still craving Clementines; and I read recently, that Vitamin C not only helps with iron absorption (from meats), it helps prevent stretch marks by supporting the production of collagen in the skin! Yay! So I’m gonna keep eating those. I’m also taking a Vitamin C supplement at night before bed. I’m still taking enzymes, probiotics, and vitamin D. My Cod Liver Oil/Butter Oil capsules arrived. I’m happy to have added those back. I went pretty slow on the row. It is a warm-up after all. On the 4 round for time, we were supposed to do a round and then rest for 3 minutes, but I got confused and went right into the second round without resting. Then I had a 2 minute rest b/w Round 2 and 3 and a 3 minute rest b/w Round 3 and 4. It was a good class. My round ligaments hurt a little in the evening after this class. Here’s the WOD. The only thing I changed was the warm-up. The prescription was a 400m Racked Walk (Heavy But Doable); but I did a row instead. I did 65% of my 1RM on the Power Cleans as prescribed, but when it came to the Front Sq and Clean Pulls, I had to scale back from 100%. I just can’t get as deep on my squats with weight. 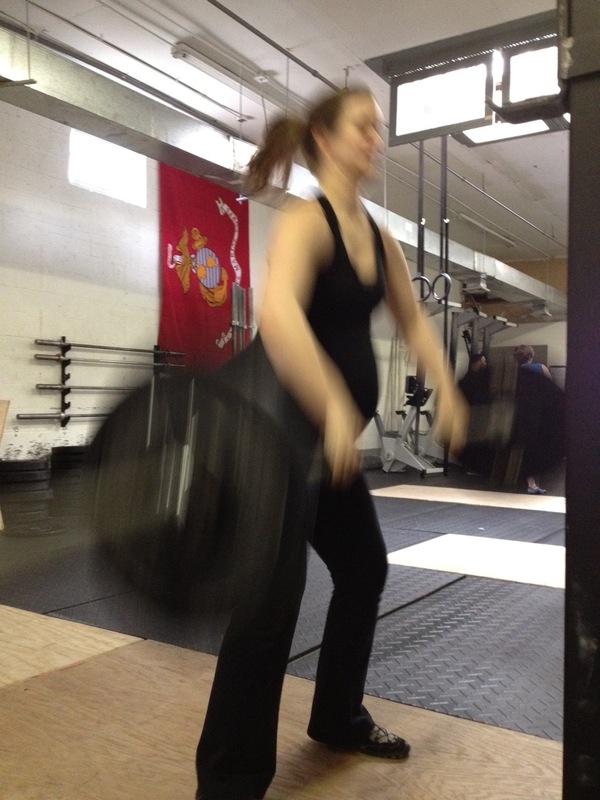 Here’s two pics of me doing the power cleans… Thanks to Coach Tami from Crossfit 718 for taking them! 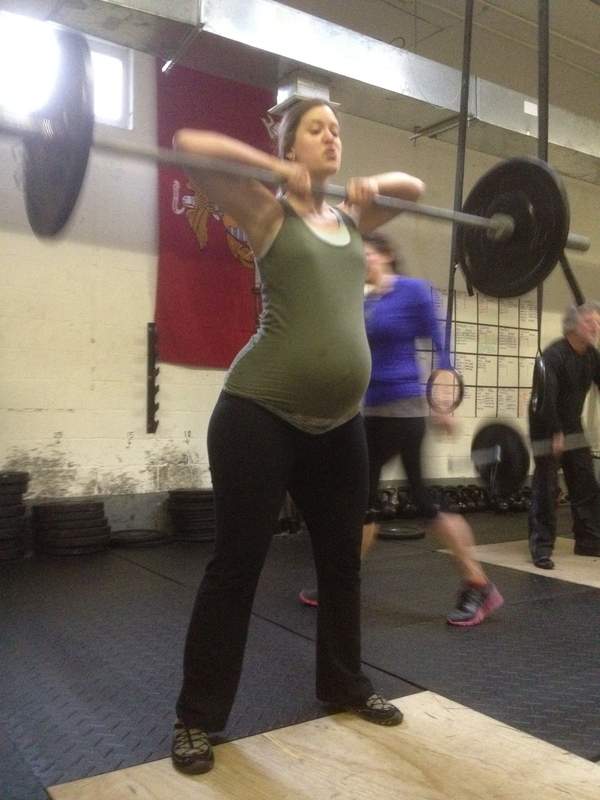 Gilliebean doing a 70# power clean at 36 weeks preggie! Then I cashed out with the 11:30 class’ last AMRAP. I used the 20# ball because it was the only one left. Golly, that thing is heavy! I think just using the 12″ box was a good way to balance that out. The 1000m row was just 30 seconds off my PR. I’ll take it. I did push jerks while everyone else did split jerks, because I didn’t think my round ligaments (they support the uterus) could handle split jerks. My current split jerk PR is 85. I look forward to crushing that after the babe arrives. Tami made me do the first 75# a second time because she said I looked wobbly. I did. For some odd reason, I did a crappy split jerk on the first 75#. 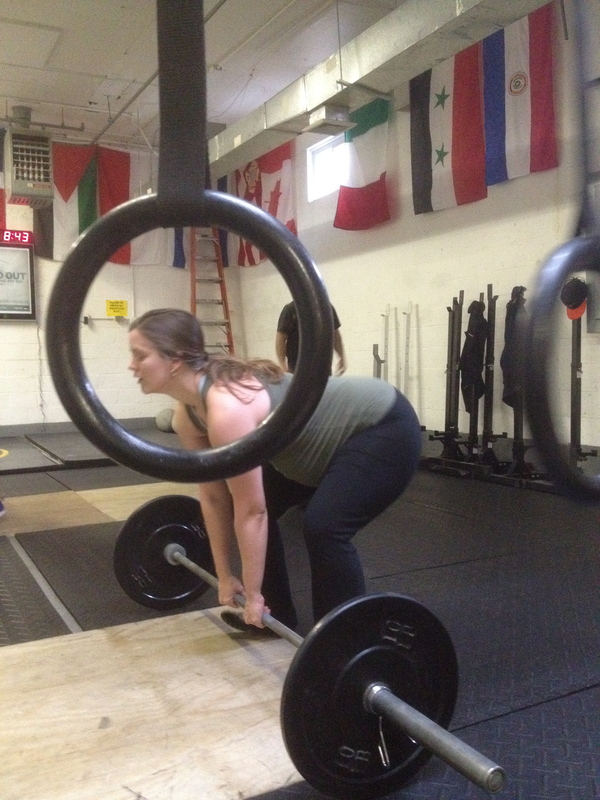 So I did it again, as a push jerk. During the 5 RFT met-con, my legs felt heavy and stiff on the box steps. Also, interesting to note, even though my ring dips were leg-assisted, my legs were burnt, so they weren’t that much help. During the last met-con, for which I sub’d air squats for double unders, my round ligaments were fine until I got about 25 reps into the ball slams. Usually it’s running that will push them past their limit but now it seems that high volume squat reps will do it too. I think I’ll pull back on the max effort squat-type movements for the remainder of my pregnancy, which could be five days away or five weeks away. Here’s a picture from 36 weeks! Gilliebean at 36 Weeks Preggie! At 35 weeks plus one day, I had another midwife appointment. The babe is still head down on his or her side. I’m glad s/he’s in a good position for labour and seems to prefer that position. I’m also expecting a little squishy-face because of it. My fundal height was good – 35 cm! My babe’s heart rate was good – in the 140s! And my blood pressure was good – 106/60. Woot! I’m getting at least one non-exercise-induced Braxton Hicks contraction per day. At first they hurt, but now I’m just relaxing into them and enjoying the wave of energy. Yes, enjoying. I’m hopeful that this will prove to be good practice. As my belly has gotten bigger (in the last week), lying on my side has gotten slightly less painful; because the belly requires less support. Also, I think my mattress is sagging, so that helps…? Thankfully I haven’t had any crazy swelling in my ankles or legs. Just mild stuff that comes and goes based upon my activity level. More active = less swelling! I told my midwife that I just didn’t feel right about taking the Evening Primrose Oil and she was fine with that. I’ve been craving Clementines and so I eat about 2 or 3 of those per day. They are in season. I’m still eating mostly gluten-free, grain-free, low-carb primal. I eat dairy; so I can’t really call it paleo. I’m still eating high-fat nutrient-dense real foods. I’m taking enzymes, probiotics, and vitamin C and D. I ran out of my Cod Liver Oil/Butter Oil capsules. I still need to order more! Today I walked 1/2 mile briskly. That is all. So I couldn’t help myself. 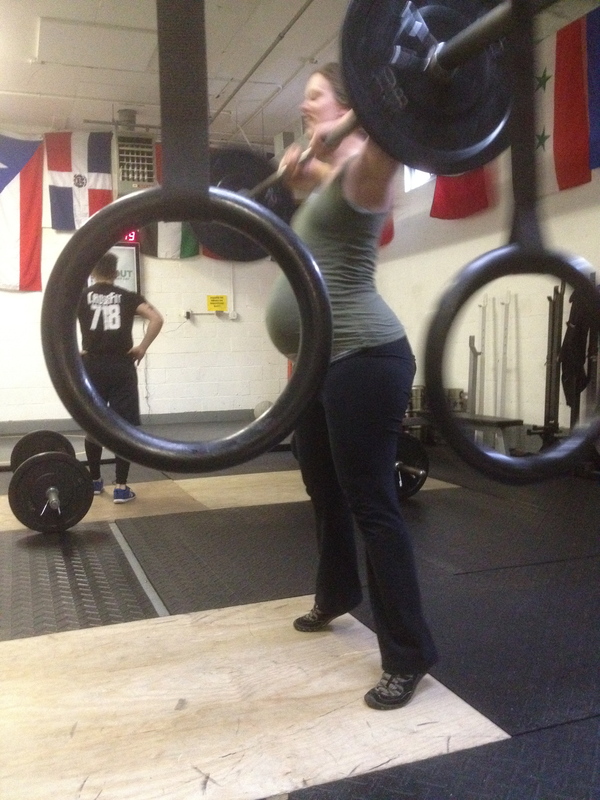 I showed up to do a preggie-version of WOD 12.3. My warm-up was 3 minutes of baby burpees (which are jumping air squats and a wall push-up) and about 10 or 15 pull-ups with the green band. …for a total of 276! I felt good and strong. Perhaps because of several days of rest. Saturday! I was lazy for most of the day and then just before dinner decided it’d be good to do *something*! So I decided to do four (4) tabatas. There. Sweaty pregnant lady did 16 minutes of stuff. 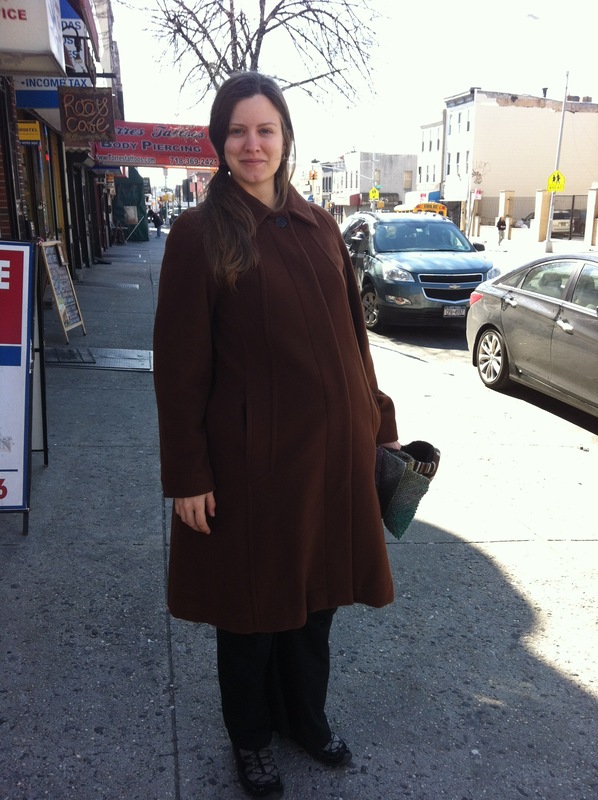 Here’s a picture of me at 35 weeks in a giant brown coat! I think I look like the brown M&M. Gilliebean, at 35 Weeks Preggie! At 34 weeks, I’m getting a few more non-exercise-induced Braxton Hicks contractions. About one per day or so. Instead of getting them when I walk up a hill or up stairs, I’ll have just been sitting around and I get one! So strange! Sleeping on my side is becoming less comfortable and reflux has gotten worse. Consequently, my sleep is more fitful and my days are full of more fatigue (could be lack of sleep and could be just third trimester stuff). Also, calf cramps have increased. Should I increase my magnesium intake? Also, I just noticed very mild stretch marks on the bottom side of my ever-growing belly. More coconut oil!! 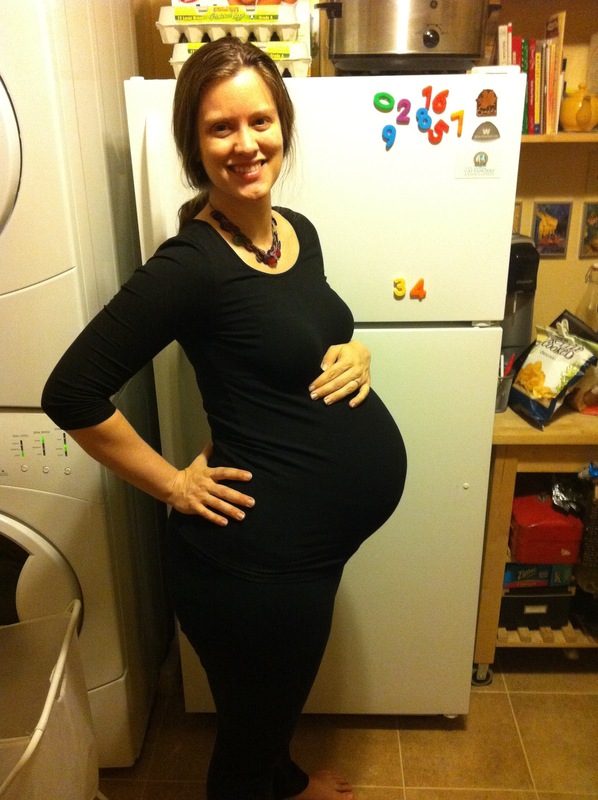 At 34 weeks, I’m still eating mostly gluten-free, grain-free, low-carb primal. I eat dairy; so I can’t really call it paleo. I’m still eating high-fat nutrient-dense real foods. I’m taking enzymes, probiotics, and vitamin C and D. I ran out of my Cod Liver Oil/Butter Oil capsules. I need to order more! I haven’t started the Evening Primrose Oil, as per my mid-wife’s suggestion. I’m not quite sold on that notion of “ripening my uterus” yet. The jumping jacks felt a little funny, so I did them half pace. With the figure-8s, I dropped the KB a few times. It’s hard to get deep enough and keep my chest up and still do them because of my belly and the length of my arms; so I end up crouching over a bit. It’s not perfect. Walked one (1) mile. Walked very slowly. Carried two large storage tubs (apron 25# each) up two flights of stairs. The tubs have the birth pool and extras in them. For Tyler, I used one green band and one blue band on the pull-ups. My ring dips were leg-assisted. SDHP were Rx. Rawr. On the Tabata Air Squats, I kept pretty consistent at around 10 per round. Preggie’s slowing down! 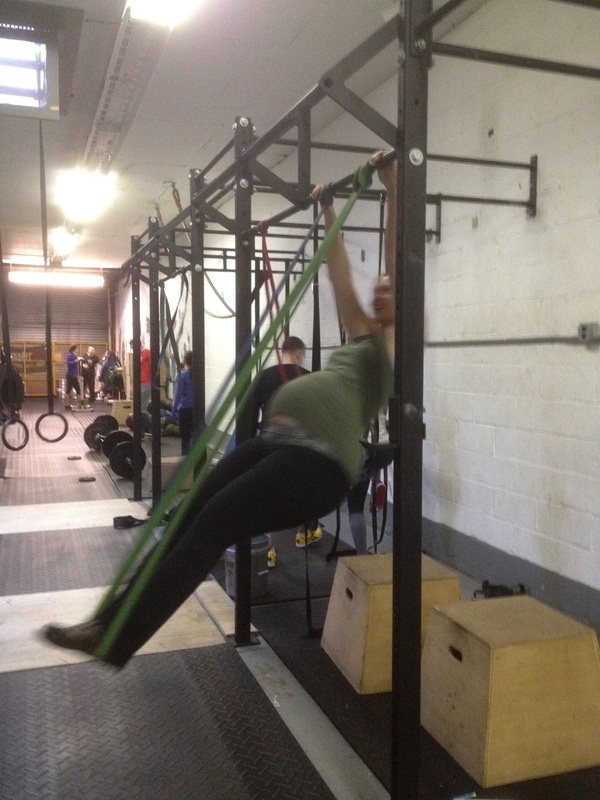 Still, it was a great workout and Coach Tami from Crossfit 718 got some great pictures of me too! 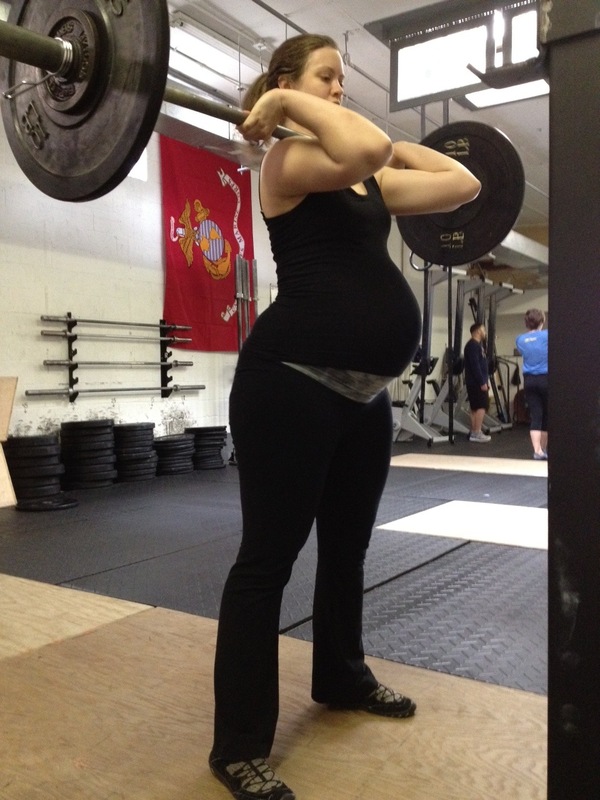 Gilliebean doing Sumo Deadlift High Pulls (65 lbs) at nearly 35 weeks preggie! 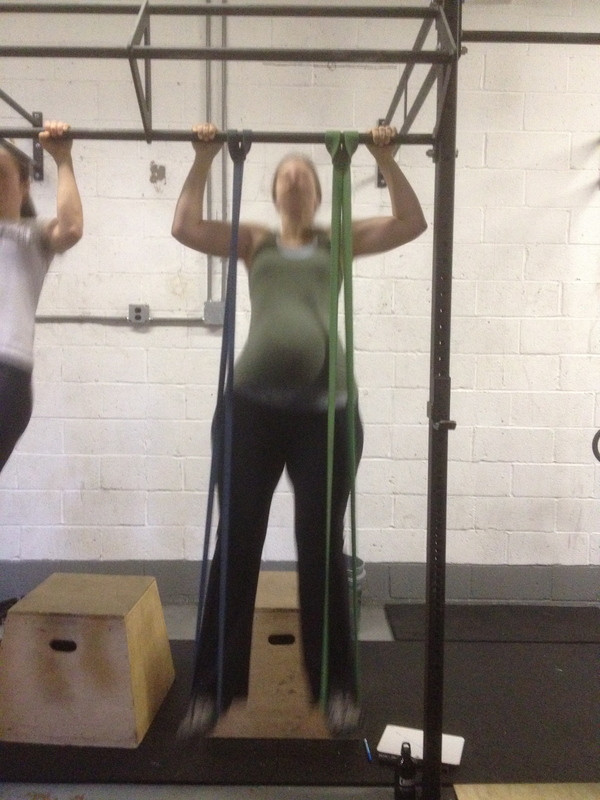 Gilliebean doing band-assisted pull-ups at nearly 35 weeks preggie! Short KB workout at home. All movements with 15# KB. Felt good to get moving! Gilliebean at 34 Weeks Preggie! And here’s a video that made me cry. You are currently browsing the Club Fritch blog archives for March, 2012.